The local government of Datong, North China's Shanxi Province was criticized for demolishing part of the original 600-year-old ancient city and building a replica to fake the original. The town is a famous historical site which was built in 1372 during the Ming Dynasty (1368-1644). But China's Cultural Heritage Administration (SACH) found out recently that the city demolished original buildings of this ancient city and to fake the old ones. 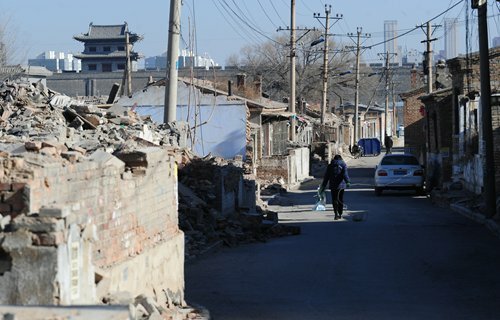 Four other cities, namely Liaocheng in East China's Shandong Province, Luoyang in Central China's Henan Province, Hancheng in Northwest China's Shaanxi Province and Harbin in Northeast China's Heilongjiang Province, are also criticized for failing to protect their historical cities. SACH required those cities to rectify their problems and submit reports to relevant authorities before May 31. SACH will request the State Council to remove anyone who fail to make appropriate rectification from the state list of ancient towns with historic and cultural heritages. Datong started to renovate the ancient city in 2008. They repaired 70 percent of the ancient wall [which surrounds the town] by using original materials; and renovated historical sites in this town, news portal thepaper.cn reported.